Two seat components are manually loaded to a 4 station dial indexer. The parts are staked together at the second station and inspected at the third station using a camera and probes. The accepted parts are automatically unloaded at the fourth station. Lids for the case arrive at the cell on trays. A servo pick and place will remove the lids and places them to an indexing pin conveyor at a pitch equal to the dial table fixture tooling. Once on the dial table, the cases require radial orientation to locate the case for the top cap. The caps are bowl fed to an escapement where they are transferred to the inner dial fixture tooling. The caps will require radial orientation as well. Once the hot melt glue is dispensed on the case, the caps are placed onto the case and tamped in position. The completed assembly is then unloaded from the dial table. 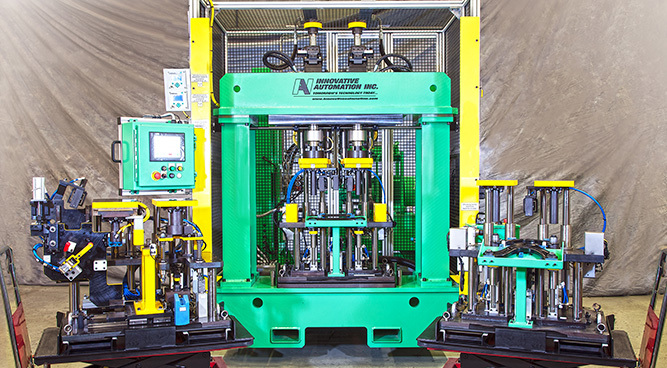 Hydraulic presses are used to assemble the components of this automotive device. After the press operations, additional components are loaded and fastened with DC electric screwdrivers. Part marking is completed on accepted parts. Parts are loaded to a universal pallet capable of handling variations of the product size. On board clamping maintains the orientation of the parts through the manual assembly process. The pallets are hand passed from manual station to manual station. Upon completion of the part assembly, the clamps are retracted by the unload operator. 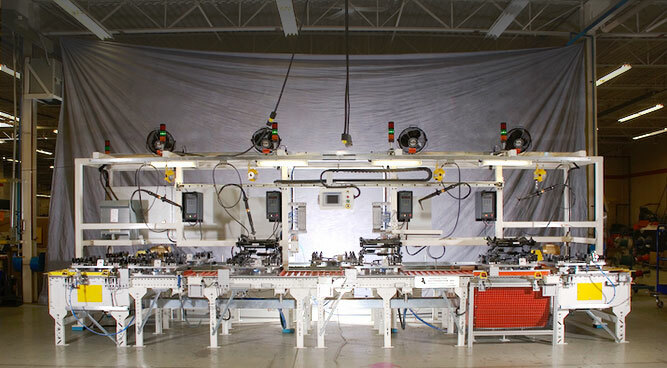 The pallets return to the beginning of the assembly process on powered conveyor transfers.